Back from Vacation and a great post to come! But I am glad to be home with my family and all the fun that follows! Come back and visit tomorrow. I will be addressing a great question on Natural Family Planning and some of the Church’s teaching on procreation and birth control. You may have an opinion, you may not know what the Church really says on birth control, so come back and see! Back to the task at hand. I didn’t get any questions for this week so I thought that I’d channel my past teaching self and administer a little quiz. Your incentive: You have a little over 24 hours (until Wednesday Sept 8 at 4pm CST) to email me your answers. Email them to caffeinatedcatholicmama@gmail.com Of the correct answers, one will be chosen at random to receive your very own, hand-crochet (by the CCM!) 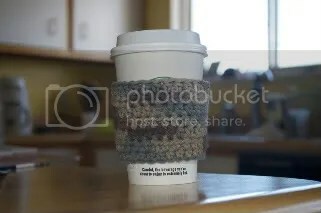 cup cozy. It’s made out of cotton, thereby making it suitable for both hot and cold beverages. 1. True or False: When people die, they become Angels. 3. At the Consecration, the bread and wine take part in a doctrine known as _____________ to become the Body and Blood of our Savior, Jesus Christ. 4. True or False: The beginning of the Liturgical Year is the first Sunday of Advent. This weekend brought some changes to our household. 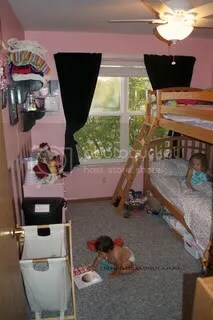 The biggest of which is the addition of Bunk Beds to the Bear’s room! The husband and I have been discussing the sleeping arrangements for a bit and we’ve decided that it was time to start transitioning The Dragonfly out of our bed and into her own and since The Bear tends to slide out of her toddler bed (for lack of space) we thought “Let’s upgrade the Bear to a twin bed and move the crib/toddler bed into our room.” One of the husband’s co-workers now has 2 kids in college and 2 kids in high school and since there is now the room, the two younger girls were no longer going to share a room and he was looking for a buyer for the bunks. We got a great deal for them and are very happy. For now the plan is to have The Bear on the bottom bunk and The Dragonfly will sleep in the crib in our room for naps (and eventually at night) until she out grows the crib. After she outgrows the crib… who knows. 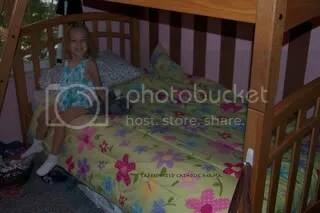 I don’t like the idea of The Bear being on the top bunk until she is older (like 6) but I don’t think we will have the Dragonfly in the “master suite” until she is three. I figure we’ll cross that bridge when we get to it. 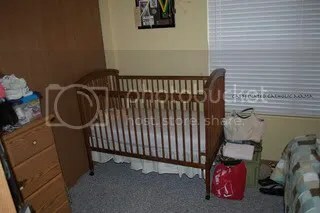 The hardest thing for me is seeing the changing table in the basement. We were not really using it since The Bear potty learned and the Dragonfly likes to roll during diaper changes, but that table’s been in that room for 3 years! I know that we are not done having kids but seeing all of these changes kind of makes my uterus hurt! Since a post is nothing without pics, enjoy! A few years back, those WWJD bracelets were huge. I am not sure how they got started but everywhere you looked, there was someone wearing a bracelet that said WWJD (What would Jesus Do.) I guess they were used as kind of a conscience guide, a moral compass of sorts. You don’t see them much anymore but the sentiment is still here. Earlier, I talked about the importance of the varying Elizabeths in your lives and this week, one of my favorite bloggers wrote a piece on how we need to stop judging each other and start helping each other. Last week, I was struck by Strep Throat. I’ve never had this illness and I was sure that I was dying of something for sure. (OK, I can be a little melodramatic but it was horrid.) What made the situation worse is that my husband was traveling for work and not home. I know that a character flaw of mine is that I am too proud to ask for help when I need it. I’d rather muddle through and hope for the best rather than just saying “Hey, I can’t do it all… I need help.” This illness made me lose my pride and ask for help and help arrived in my friend, Paulette. Paulette is the mother of 4 grown children and quite a few grandsons, but no granddaughters so she’s adopted my girls as her own. When I called Paulette on Thursday and asked for help, she came right over. I can’t tell you much as to what happened as I spent most of the day either sleeping, vomiting or nursing but I know that my girls were happy and my dishes got done (Bonus!) She repeated this on Friday, when I finally decided to go in to see what was going on and stayed both nights until my girls were in bed asleep before heading home herself. Paulette gives selflessly. She thinks nothing of what other things she could be doing, rather she focuses on what is needed at that time. She tells me time and time again that she’s been there… she’s been a mother with little kids and a husband on the road and in her case, like mine, she didn’t have family near… she also didn’t have her own Paulette. Just that little action of being there for a mother is huge. So, maybe, instead of thinking WWJD we should be thinking WWMD (what would Mary do) or WWED (what would Elizabeth do? ) While Christ was fully human and fully divine, Mary and Elizabeth were fully human and fully mothers. So what can you do to help out another mother in your life? Think small… fix an extra lasagne and drop it off, call her up to see if you can take her kids for an hour or two, offer to pick her kids up from school, pick up an extra latte or tea next time you are hitting the drive-thru. It doesn’t have to be much but it will mean a lot to her. What would you do? How can you worship a homeless man on Sunday but then ignore another homeless man on Monday? Ok, Ok, I admit it. I haven’t been the best about blogging everyday but I am getting better. I’ll be honest, sometimes I feel like I haven’t gotten my message from the Spirit and I figure it’s better to not write anything than to write a bunch of dribble. Today I took a Spinning class with Francis at the Y. (If you have never done Spinning, I encourage you to try… it’s a great, low impact workout. You might be a little saddle sore after your first few classes, but it gets better!) Anyway, Francis is a fantastic Spin instructor. Her rides are set to good music and she pushes you. Today was a particularily tough ride… lots of hills (high resistance) and lots of speed. The goal of the ride was strength and speed work. About 40 minutes into the 60 minute class, Francis started to tell us to “get out of your comfort zone.” That’s almost a Francis motto and I am sure that it’s used by personal trainers the world over. Why? Let’s think about this. If you are pushing a certain weight or running at a certain speed or swimming on a certain pace and you are feeling good and groovy and thinking to yourself “Hey I could do this all day!” You are in your comfort zone. You are not going to get any stronger or faster by hanging out in the comfort zone because your body has adapted to the workload and doesn’t have to work as hard (translation: burn more calories) to do the workout. But man, does it stink to push yourself out of that comfort zone. It hurts, your breathing accelerates, your mind starts saying stuff like “you can’t do this.” You know what… You’re right. If you think you can’t do something, you won’t. If you KNOW you can do something, you will. Get out of your comfort zone in your home as well. For a while I have wanted to put an image of Divine Mercy in my home but I resisted because my husband is not on the same path as I am, spiritually, and I didn’t want to make him feel weird to walk in to see Jesus greeting him. But this weekend, I bought one and it’s proudly displayed under our Crucifix in out foyer. I got out of my comfort zone and I am displaying for all to see that a Catholic Family lives here and that we are headed by Christ. That act took me out of my comfort zone because I always felt that the home should be equal parts him and her as far as decorating, but since Christ is such a large part of my life, why would I allow that part to be censored? Look within and decide where your comfort zones lie and challenge them. Only good can come of it as it is only by challenging the self do we grow. As we enter into the week of thanksgiving, we finally take the time to slow down and decide what is important in our lives. For most of us, food, shelter and family are at the top of that list. We might throw in friends or pets or maybe that new promotion but there are times that I wonder if we are really thankful for all of those things or are we just grateful for them. What’s the difference, you ask? I try to think of “thankful” as being more of an external emotion, while being grateful is more of an internal emotion. I am thankful that my husband has a job and I am grateful that I don’t have to deal with the things that he does. Thanks is easy to express, but gratitude… not so much. Often we tell people thank you and what is their common response? “No problem,” as if you were implying in the first place that it was a problem. Humans are not made to live in isolation and it is inbred in us to want to help the other person. This is very inherent when you look at the altrusistic nature of toddlers… they love to help just for the sake of helping. Somewhere along the lines of time, we lose that desire to help our fellow man just for the sake of helping and we view our desire for help as being a burdon on someone else. Faith teaches us that we are supposed to always help each other because that is what Jesus wanted of his followers, but one has to ask, if we are doing all of the helping, WHO is being helped? There is no shame in asking for help, but the deadly sin of pride keeps many of us from asking for help. On His way to Golgotha, our Lord fell, not once, not twice but three times. When we ask for someone’s help, we are acting as Jesus TO them. There is no shame in asking for help, there is only sin in thinking that it is too much for you to ask for help. Tonight was a really rough night here. Scratch that… today was a rough day. My husband caught a 5am flight out West and my day started at 5am as well with the girls getting up. I was confident that everything would work out well but I was wrong. Lucia is 10 weeks now and that has to be a factor, but this child decided that sleep was for suckas and would not sleep unless she was in arms. I tried the sling, the wrap, the bouncy chair… all bupkis. I would guesstimate that her total sleep for today was at most 2 hours. When she fell asleep at 6p, I was super excited, thinking “Great, she’s out. I’ll get Brigid down and everything will work out well.” Nope. She woke up 40 minutes later. Brigid had a lonely bath as I was trying to get her sister to sleep, story time was cut short and she had to endure Lucia’s crying as I was singing her to sleep. By 830p I had reached my limit and I did something I thought I’d never do… I called my mom, crying. She told me everything would be OK and that I could do this without DH being here. She calmed me down and I was able to finally get Lucia to sleep and I finally was able to eat as well. I love my husband, but I don’t think that he would have been able to endure what I went through tonight… hell, what I go through everyday. Mommies surely have the bulk of the work to do in many families and I can’t help but wonder how Daddies get away with so much? Is there a disconnect in the nurturing styles between men and women? Is the bond between mother and child really so strong as to supercede everything else, or have men, through years of conditioning just taken themselves out of the picture?